This page lets you see how VPOP3 has processed recent messages. If you know VPOP3 should have received a message but it has not been delivered, or has been delivered incorrectly, you can search for it on this page, and VPOP3 will display key trace information to help diagnose what went wrong. First, you should enter as much detail as you can into the Search Subject, Search From and Search Any fields. 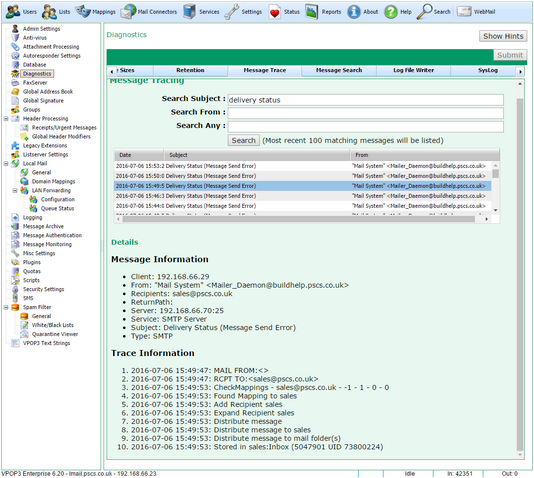 The Search Any searches any of the traced message's information fields, such as sender IP address, recipients, etc - see below. Then, press Search to see a list of the most recent 100 messages which match the search data. VPOP3 keeps this data for 1 week, so there may be fewer than 100 matching messages. Select the message you wish to investigate in the list of found messages. •Message Information - this contains details about the message to help identify it. The data here will depend on how the message arrived at VPOP3 (SMTP or POP3) and other details such as authenticated senders, and so on. This data is unordered and just helps to identify the message. •Trace Information - this contains an ordered list of key events in the processing the message. For example in the above screenshot this shows that the message arrived at VPOP3 using SMTP, and the SMTP 'RCPT TO' command indicated 'sales@pscs.co.uk' as the recipient. VPOP3 found a Mapping of sales@pscs.co.uk -> sales, so it added that recipient to the message, and eventually delivered the message to 'sales', storing it in the sales 'Inbox' folder, with an internal message ID of 5047901, and a UID of 73800224. The information displayed may be a bit technical, but reading it will often help to highlight what happened, such as an unexpected Mapping causing misdelivery of the message, or that the message was quarantined, etc.